Do you have a Problem with Corns on your Toes? 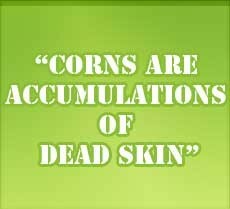 Corns are accumulations of dead skin. A corn has a hardened core in the middle. It can develop on top of your toes or between your toes. Corns develop when there is friction or pressure against the toes. This is typically caused by the toes rubbing against the shoes or against each other. When corns develop on the tops of the toes or the outer edges of the feet, their surface becomes very hard. When corns occur in between the toes, the moisture there keeps them soft. In this case, they are known as soft corns. When you visit a podiatrist about corns on your feet, she will probably remove the corn for you. However, if the problem that caused the corn is not resolved, the corn is likely to return. Your podiatrist may also recommend that you wear more appropriate footwear, use orthotics, or pad the toes to prevent friction. Wash your feet with soap and water every day. After drying the feet, use a specialized foot cream. Wear clean socks every day. Use a pumice stone frequently to remove any buildup of dead skin. Wear shoes that fit comfortably and are well-padded. The toe box should be wide and roomy. Wear loose-fitting, thick socks that do not have seams that rub against the toes. Plan to go shoe shopping late in the day, when your feet will be most swollen. This will ensure the most comfortable fit. If you experience corns on your toes, visit Foot Solutions UK. We will help you to find shoes that roomy, comfortable, and accommodating. Wearing the right shoes is essential for preventing recurrence of corns. If your corns are caused by a foot deformity or gait abnormality, we will assess that and fit you with insoles or orthotics to accommodate that condition and prevent further problems. We can even order custom shoes for you. Visit Foot Solutions in your area today.